The above statement is something of a motto or even perhaps a sort of mission statement for this movement of which I am a part and in which I am engaged in a hopeful way. However, in an effort for full disclosure, there are times when I don’t really know what is so compelling to me about the ‘Church.’ I will accept it as a mystery, even a calling from Christ to love and serve the church, even though most Evangelical churches wouldn’t entertain my gifts. Still, much of the time, the church is a sorted and messy affair, not at all as we imagined she should be. I have lived too long and been involved in one way or another with too many churches to think otherwise. We know that the church is referred to in Revelation as the ‘Bride of Christ.’ She is presented in her glory and perfection, eager to join her groom at the final wedding celebration. This vision of a beautiful, pure, and glorious church captivates our imaginations. A bride prepares for weeks for this final event. She takes extra care to prepare her body both dressed and undressed. Nothing is hidden. All is beautiful. Her bridesmaids join her in the sanctum of the final preparation, each as excited and as prepared as the Bride. We Christian leaders are those bridesmaids, eager to be part of her preparation and presentation. This is the vision. This is what calls me, and yet at times I feel very foolish, as if this were a trick. I know the church is not a ‘vision’ of perfection. I have planted churches, and nothing pulls out the very best and very worst of you than a church plant. I have led believers and walked with leaders. We all know this reality. The church is hardly pure. We are hardly pure. The church’s people, every one of them, are on life-long journeys, often distorted and uneven, to spiritual, mental and emotional maturity. Sometimes the church’s people are even ugly and hostile. So why do I keep trying? Why do we believe that somehow this generation, or that book, or that theology, the next exciting leader, or fresh movement with creative ideas, or even Missio Alliance will make a difference? These are questions I ponder deeply. Honestly, I don’t know that the church is any worse or any better than it was generations ago. I have lived too long to trust the myth that somehow ‘we’ can get it right. So what is the answer? A number of years ago, after over two decades of disappointment with myself as a leader and pastor, I found myself at a crossroads. I could mark out my days and retire, quit the ministry and do something different, or fight to survive and to do so successfully. I chose the latter. Humility – I refuse to give up on myself or on others. Therefore, I need to humbly cling to Jesus each and every day, each and every moment. I am the woman with the issue of blood, unclean. The church is the woman with the issue of blood, unclean. I cling to the hem of Jesus’ garment daily for my healing. My own commitment to becoming more like Christ must be made honestly and with humility every new day I face. Community – I commit to always journey with others, even as Jesus did from the beginning of his ministry to the end. I need like-minded friends. I need safe places to process, learn, and question. This is why Missio Alliance matters to me. I fit here. I find others who love the church here. We are listening, seeking, learning together. I am committed to journeying with these friends. They challenge me. They teach me. And in a humble way you and I contribute to the conversation. Quiet Spaces – I must create spaces for solitude in order to listen to the Holy Spirit. I am too easily deceived by my own limited world view. The distance between forging our own way forward and following the Spirit of God can be a hair’s breadth of quiet listening. I commit and I invite you to commit to 30 minutes of quiet listening to the Holy Spirit each day. This matters. Otherwise, we can be deceived by our own plans and perceptions. Listening for the Holy Spirit each day, this we must do. 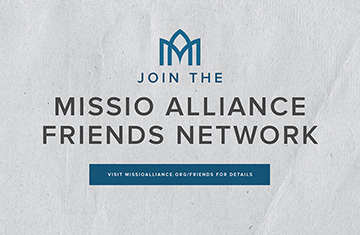 I’m looking forward to our life together in Missio Alliance; loving the church and her mission and people. And I believe that when we commit to this together, and we create spaces for active engagement and quiet spaces, that whether we get the church exactly right or not will not matter as much as being the faithful bridesmaids preparing the Bride for her Lord.